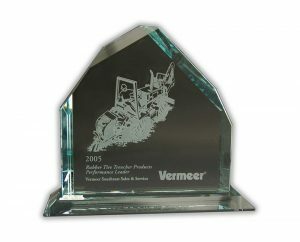 If you’re looking to bring variety and elegance to your corporate awards, consider a sandcarved glass, marble, or crystal piece. Sandcarving results in a stunning final product the recipient will want to display in their home or office. Sandcarving awards or trophies results in a frosted look. The logos, text, and graphics can be produced in fine detail with crisp edges. Color fill can also be added in some applications. Sandcarving is available on materials in sizes up to 20″ x 30″. Please call 877-549-5447 for price quotes and additional information regarding sandcarved products. We have a $50 minimum order. Watch our sandcarving process in the video below.